Kingsnake.com - Herpforum - RE: butting in again! LOL! RE: butting in again! LOL! This spring has been dry and warm compared to last year, which was quite wet and chilly. The snakes are indoors and have the benefit of a heated cabin, so I am not sure how much the weather impacts their behavior. 2012 my bulls mated in early April 9 and so forth and in May 26 she had her pre-lay shed. She laid her clutch in mid June. The babies hatched August 18 to August 22. 2011 her babies hatched August 6 to August 7. 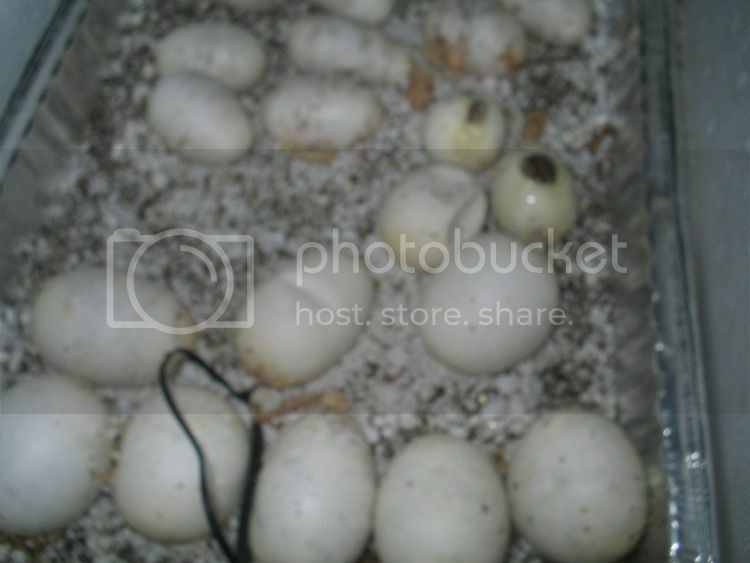 That was the surprise first clutch as I didn't see them mate and didn't realize she was gravid until she got quite plump with eggs. This year I had initially kept them apart to prevent more babies, finally relenting and allowing matings April 27-30. Just felt so sorry for the male, who went off feed in March and really wanted to breed desperately. His mate was quite hefty and in fine fettle coming out of brumation, so although I now will have more bullsnake babies I don't feel she will be harmed in any way by having a clutch this year. These are my only adult bulls and I have not had them long enough to discern whether or not they are early or late. Because I kept them apart most of April I expect babies will arrive in September instead of August. So this year looks to be a bumper crop of babies if all goes well, as everybody who was sexually mature has bred. Last years' pits. The two funky little eggs are in the process of hatching first. Wont be long it will be time to fire up the incubators again!